Culms: Stems are rhizomes, short- or long-creeping, gray; scales tan to brown. Leaves: Few or solitary, twice pinnately-compound, arching, entire blade fan-shaped, 6 to 12 inches long, 4 to 14+ inches wide; stalk erect, to 18 inches long, black or dark brown, glabrous, forked at top into 2 recurved branches; pinnae oblong to linear, 1.2 to 12 inches long, .6 to 2 inches wide, produced from upper side of rachis branches; ultimate segments alternate, short-stalked, variable, mostly 15-35, wedge-shaped to oval or nearly rectangular, .4 to 1 inch long, glabrous; main vein parallels lower margin; upper margin variously notched; sori separate, marginal, linear to oblong or kidney-shaped, borne on veins or vein tips. Habitat: Shaded deciduous woods, stream edges, rocky seeps, hillsides, slopes of ravines, often on northern exposures; prefers moist but not wet soil. Uses: Native Americans boiled the roots and applied the liquid to areas affected by rheumatism; powdered the leaves and smoked them for asthma and heart problems; and steeped the plant for treatments of fevers. 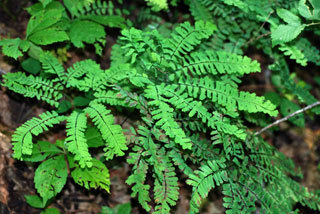 The green fronds were chewed to treat shortness of breath. The stems were softened and woven into black designs on baskets. The stems were used as a good luck charm when hunting and were inserted into ear piercings to stop the wounds from closing. Comments: Ferns reproduce by spores.